Registration at AS&RCs: Other option is that candidates can apply through nearest AS&RCs, So Candidates may report at nearest AS&RCs for registration / allotment of roll no. along with necessary documents mentioned in pars 6 and the prospectus fee for completion of registration formalities. Candidates will bring these documents on the day of test as well. Overseas candidates Pakistani National : Overseas candidates can apply at nearest Consulate General of Pakistan. Defence Attache will forward the applications of suitable candidates to PA Directorate after stamping as OVERSEAS PA Directorate will intimate the date and time of preliminary tests closer to ISSB Tests / GHO Selection Board. Candidates will report on exact date and time given for preliminary tests at nominated AS&RCs. Date once given will not be changed. Candidates will also bring along documents mentioned in pare 6 and will pay prospectus fee on the day of test Candidates MUST attain working knowledge of computer as registration and tests wit be conducted on computers. No TA /DA will be admissible. You must prepare the Written Test and Interview and we are providing you the Online Test Preparations those will help you in your written test and Interview Both. And those tests will help you to clear the Intelligence test as well. You can prepare your general knowledge and current affairs Verbal and Non Verbal Tests as well. (a) Anesthesiology (HPG) (Male/Female) (b) Pathology (HPG) (Male/Female) (c) Radiology (HPG) (Male/Female) (d) Basic Medicine Sciences (Male/Female) (e) Gynecology (HPG ) (Female) MBBS with higher postgraduate qualifications i.e. MRCOG, FCPS (Pak), FRCS, MS American Boards/ Certificate or equivalent in respective fields of specialties. 32 years. Relaxable upto 40 Years in case of better qualification / experience on the recommendations of the GHQ Selection Board. Note: Lower Postgraduate (MCPS, various Diplomas) qualified candidates shall be granted rank of Captain. Candidates qualified from Government Institutes shall be preferred. NATIONALITY: Citizens of Pakistan and domicile holders of Azad Kashmir / Gilgit – Biltistan. Upon final selection, candidates with dual nationality will have to surrender nationalities other than Pakistani. Twice rejected by GHQ Selection Board for SSRC. (However, candidates attaining higher qualification shall be granted additional third chance). Declared medically unfit by concerned CMH / Appeal Medical Board. Individual withdrawn / resigned / discharged from Armed Forces (Army, Navy and Air Force) training academies / institutions on the grounds of discipline, character, medical inefficiency, weak profile or declared unsuitable. Individuals dismissed / removed from any other government service. www.joinpakarmy.gov.pk. Date and time of test shall be intimated on internet, for which the individual should have an e-mail account. Candidates will report on exact date and time given for preliminary test on computerized roll no slip. Date once given will not be changed. Candidates will also bring along documents mentioned in para 6 and will pay prospectus fee on the day of test. Candidates MUST attain working knowledge of computer as registration and tests will be conducted on computers. The candidates may report at nearest AS&RCs for registration / allotment of roll no alongwith necessary documents mentioned in para 6 and the prospectus fee for completion of registration formalities. The candidates will bring these documents on the day of test as well. Registration and Preliminary Tests will held as per announced schedule . 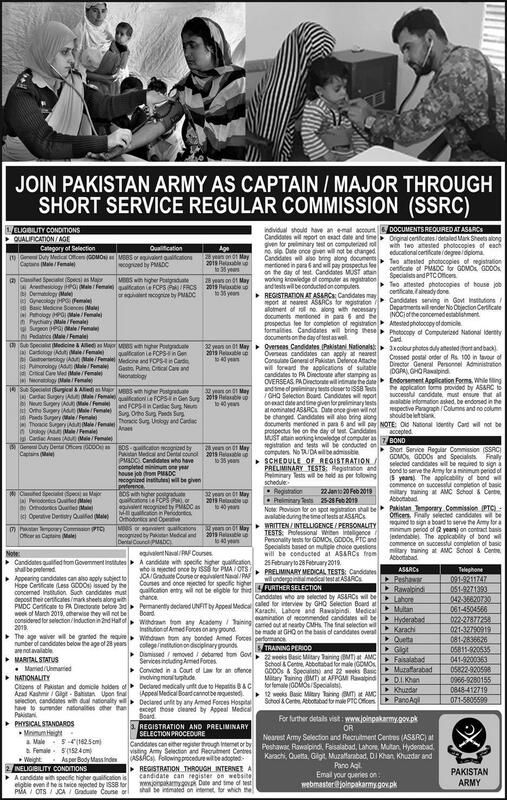 FURTHER SELECTION : Candidates who are selected by AS&RCs will be called for interview by GHQ Selection Board at Quetta, Karachi, Multan, Lahore, Rawalpindi and Peshawar. Medical examination of recommended candidates will be carried out at nearby CMHs. The final selection will be made at GHQ on the basis of candidate’s overall performance. TRAINING PERIOD AT PMA / AFPGMI : 22 weeks training at PMA and AFPGMI for male and female candidates respectively. Original certificates / detailed Marks Sheets alongwith two attested photocopies of each educational certificate / degree / diploma. Two attested photo copies of house job certificate, if already done. Candidates serving in Govt Institutions/ Departments will render No Objection Certificate of the concerned establishment. Photo copy of Computerized National Identity Card. 6 x coloured photos duly attested (front and back). Crossed postal order of Rs. 100.00 in favour of Director General Personnel Administration (DGPA), GHQ Rawalpindi. NOTE: Old National Identity Card will not be accepted. BOND: Finally selected candidates will be required to sign a bond to serve the Army for a minimum period of 5 years. The applicability of bond will commence on successful completion of basic military training at AFPGMI Rawalpindi and PMA Kakul.